Caste rivalries and a fight over offerings at a cash-rich Sikh temple in Vienna echoed far and wide on Monday as sectarian violence once again erupted in India's Sikh-majority state of Punjab. At least two people have been killed and 14 injured since news reached Punjab yesterday via text messages and mobile phones that a Sikh preacher of a lower-caste sect, 57-year-old Sant Rama Nand, had been shot dead in a clash in a temple in Austria. 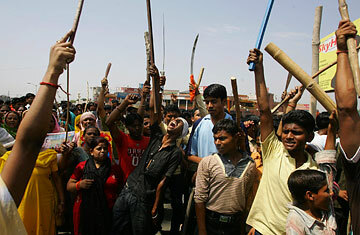 Thousands of lower-caste Sikhs took to Punjab's streets armed with swords and batons, burning buses and blocking trains. A curfew was imposed in five Punjab towns, and military and paramilitary forces have been called into the state. The situation remains tense today as the authorities try to arrange to have the slain preacher's body flown directly to his village for cremation. When news of the killing began to trickle into Punjab, state authorities went on alert. Although there is no specific history of Ravidasia-Sikh violence in Punjab, violence has taken place between followers of various sects across the state, mostly with support of lower castes among both the Sikhs and non-Sikhs. By Monday afternoon, large-scale rioting spread to six districts, leading Prime Minister Manmohan Singh, himself a Sikh, to issue a televised appeal. "Invoking the teachings of the Gurus, I appeal to all sections of people in Punjab to maintain peace," he said. The situation has spun out of control before. In May 2007, a prominent sect leader with significant political links, Gurmeet Ram Raheem Singh of Dera Sacha Sauda, had invited the ire of the Sikh masses when he addressed a congregation dressed as the tenth Sikh Guru, Gobind Singh, which is against Sikh tenets. Ram Raheem Singh's support base is primarily among the lower castes. At least one person was killed and over a hundred injured in the six days of violence that followed. Watch "The Real Slum Of Slumdog."